This is a great album, we are going through a golden period in music now, we have all the punk and affiliates coming up, The Stranglers are a case of music which is actually not as simple to categorize as you would at first imagine. Yes, they insert themselves into the whole punk scene but they are actually a bit beyond that and often sound more post-punk than punk. This comes about due to the heavy use of keyboards and the fact that they can actually play their instruments pretty well. The keyboardist has often been compared with Ray Manzarek of the Doors and this is no hyperbole, there are big elements of that type of psychedelia here, mainly on the keyboards married to the whole punk attitude and vocal delivery. Another big point in favour of The Stranglers is the fact that they don't take themselves too seriously, maybe it is because they are older than the average punk band (the drummer, Jet Black, was around 40 by the time this came out) but they are indeed funny. Peaches is a great example of what could almost be considered a novelty song, except for the fact that it is so well done, with a driving bass chord which is one of the best ever. A great punk album by an underrated band. 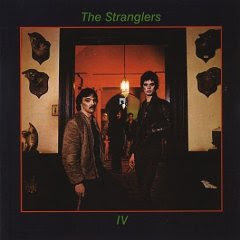 The band's name was printed as "The Stranglers IV" on the sleeve. The album was originally to be entitled "Dead on Arrival" but was changed at the last minute. It was one of the highest-selling albums of the punk era in Britain. Some websites incorrectly list the album as IV by a band called Rattus Norvegicus.